Solid wood flooring increases in value and becomes more beautiful with time. 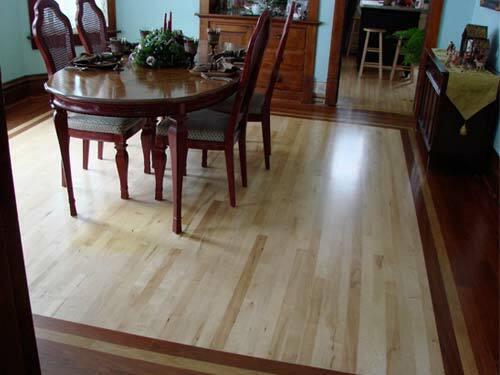 Specializing in repairing and restoring existing hardwood floors. well! We hit the jackpot when we found you." Custom medallion inlays and borders from stock to custom designs. Hardwood flooring is timeless. It enhances the warmth of any home and compliments the decor of any room. We offer Oak, Ash, Elm, Cherry, Maple, Birch along with a variety of exotic wood types. We will spend the time to help you make the choice that is perfect for you! We guarantee a high quality final product whether it's installation of a new floor or refinishing or repair of an existing hardwood floor. In a national survey, 90 percent of real estate agents said that houses with hardwood flooring sell faster and for more money. Hardwood flooring is one of the most practical, easy-care and versatile floor coverings today. Maintained properly, a hardwood floor should never have to be replaced. We serve most of Northeast Wisconsin and the Fox Valley including: Appleton, Neenah, Menasha, Oshkosh, Fond du Lac, Omro, Winneconne, Ripon and Berlin. 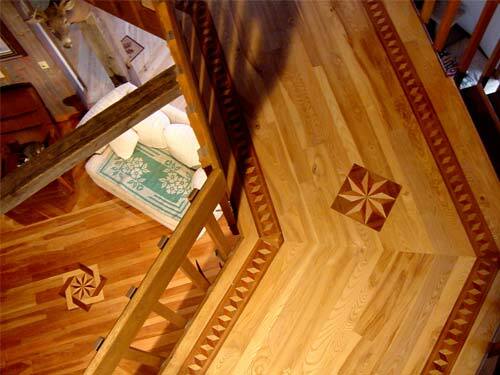 Mark's Hardwood Flooring Has Serverd Notheast Wisconsin For Over 20 Years and Has Won a National Award for Their Work. 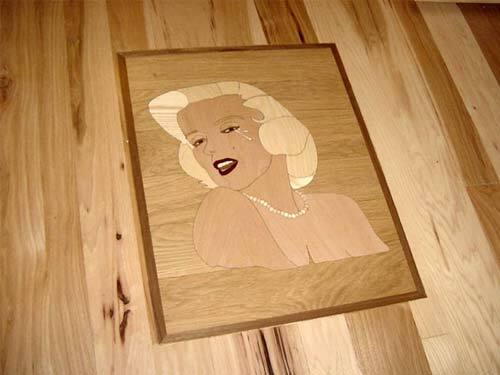 Hi, I'm Mark Strehlow, owner of Mark's Hardwood Flooring. When it comes to flooring you have a lot of choices, but I truly believe that nothing matches the beauty of real hardwood. I also believe in protecting our environment. 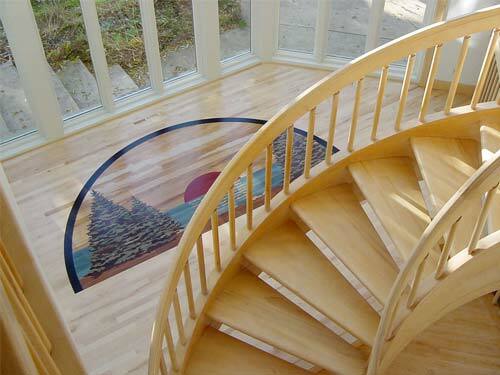 Hardwood is a renewable natural resource, unlike carpets which are a petroleum-based product. Plus, at Mark's we use the latest in water-based finishes that are non-toxic and odor-free. 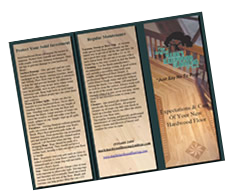 Please take a moment to look over our materials, and then give me a call to talk about putting the lasting beauty of real hardwood in your home. Owner Mark Strehlow established Mark's Hardwood Flooring in Omro, WI in 1990 specializing in hardwood floor refinishing. In the following years the company expanded into hardwood floor installation in both existing and new construction homes. Mark's artistry can now be seen in homes valued at over several million dollars. 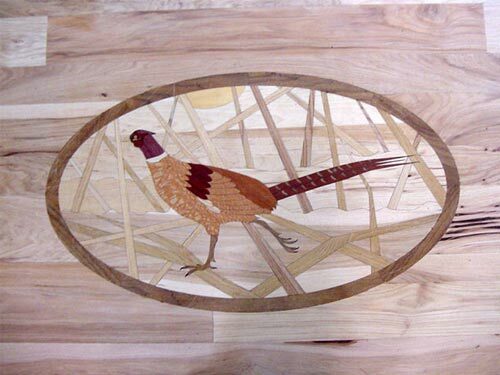 Hardwood floors, though initially more expensive than carpet, are a renewable resource and are 100% biodegradable. It will be the last floor you will ever need to install. Plus, the beauty of hardwwod never goes out of style. It is so very nice to meet people like you with true talent and commitment to what they do, and being so genuine and thoughtful as well! We hit the jackpot when we found you. The floor looks amazing. I am very happy and I noticed that you gave me some birds eye maple in the kitchen. 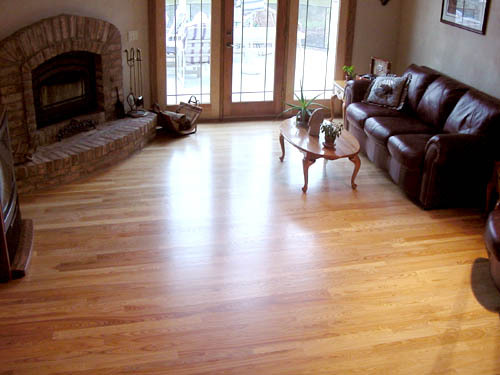 The best decision I made was choosing Mark's Hardwood Flooring for the job. Thanks again for all the hard work and such beautiful results. Thank you for all the guidance throughout our remodel. You spent more time with us personally than any other contractor. We are so glad we went natural. The stain we originally wanted would have been a big mistake. Your bedside manor is great and a major reason you have the best reputation in the area for hardwood flooring work. We will recommend you to everyone. Thank you so much! I love the floors. They are wonderful. I appreciate all the help especially long distance. My floors turned out really nice. They look like brand new floors. I will definately recommend your business. Serving Northeast Wisconsin and the Fox Valley including: Oshkosh, Omro, Fond du Lac, Appleton, Neenah, Menasha, Winneconne, Ripon and Berlin.